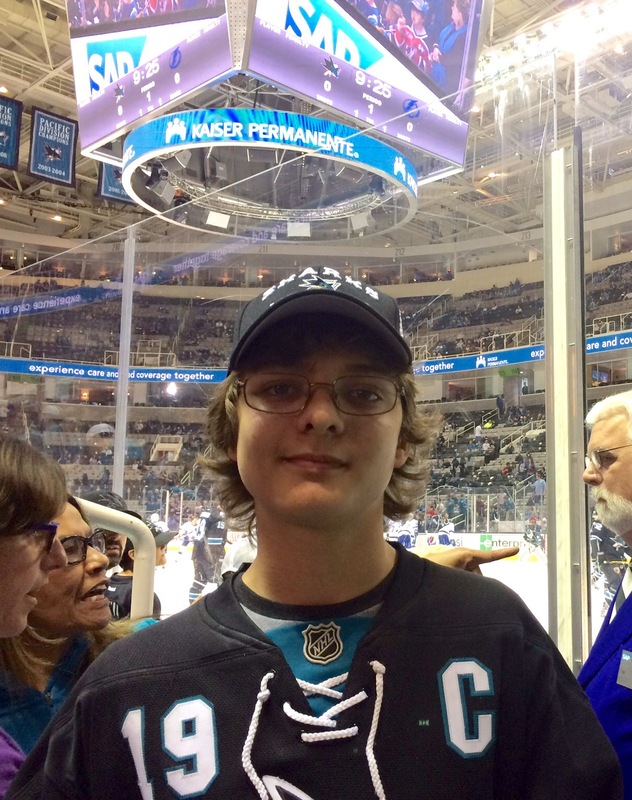 A leading autism expert and advocate, seen here at a recent San Jose Sharks game at SAP Center. When I called her, she related the story. There was an autism awareness assembly for the entire eighth grade at Ryan’s school. At the conclusion of the informational video, the students were asked if they had any questions or comments. What happened next, well, I asked Ryan for his version when I got home. “I just raised my hand and said, ‘I have autism. You might think people with autism aren’t as smart as everyone else, but that’s not true,'” he told me. When asked about the reaction, Ryan said everyone applauded. His case manager described it even more enthusiastically. We asked if anyone said anything to him. Nobody did. Veronica and I both told him, separately and together, how proud we were and how brave he was. While he was obviously proud of himself, Ryan didn’t really see it as a big deal, and I guess that is the Big Deal. Just as we were when he wrote and shared his essay (included in yesterday’s post), Veronica and I were blown away by how comfortable Ryan has become with who he is. He is not fishing for sympathy or pity. He is remarkably self-assured in that yes, he may be a little different, but that’s just him. And besides, his differences come with some awesome benefits. His self-confidence and self-advocacy, which I can assure you is not coming at our urging but something he has grown into over the last few years, is so overpowering as to ease whatever parental fears we have about the downside of such disclosures. We know that if anything negative comes of them — and so far, if it has, it hasn’t risen to Ryan’s or our attention — they will be a drop in the ocean compared to the benefits he enjoys from being so comfortable in his own skin. He’s not doing it to advocate for anyone other than himself, but even if only a few of his eighth-grade peers were paying attention, his efforts will have a positive effect in the drive for autism understanding and acceptance. Ryan’s display of advocacy in its truest form does more for autism “awareness” than any number of puzzle piece pins or buildings lit up blue. And I could not be more proud of my son. Wow, thank for sharing! I made my day!